‘A Better World’ Kara Karcher '11 is parlaying her studies in poverty and women's and gender studies into a law career dedicated to helping women and children. Kara Karcher ’11 with some of her students. My first exposure to the Shepherd Program at Washington and Lee was through the Washington, D.C. Volunteer Venture program. I knew I wanted to participate in a pre-orientation program in order to get to know some of my classmates before starting classes. Little did I know how much of an impact that small decision would make on my four years as an undergraduate at Washington and Lee as well as my future career trajectory. I remember the professor speaking with our small group during one of the days of our trip, and I made the decision to try out the Poverty 101 class in the fall. I had never thought about issues of poverty from an academic perspective and although my first-year self was very intimidated by the dense reading and the profound conversations going on in our classroom, I knew that I had found something meaningful, and I committed to making the poverty program part of my undergraduate experience. The class that made all the difference for me was Poverty 102, where I had the opportunity to volunteer inside a preschool classroom that served general education preschool students, as well as students who qualified through some type of intellectual or physical disability. It was a powerful intellectual experience to connect the day-to-day happenings of the preschool classroom I was observing with the theories and scholarly reading that we read and discussed in class. I found that I enjoyed connecting my real-life work with my academic work, and it lent a sense of urgency and importance to all of the studies I was doing as an undergraduate. That summer, I completed my Shepherd Internship at the House of Ruth Legal Clinic in Baltimore, Maryland, an experience I still consider one of the most formative components of my education. The House of Ruth offers legal support to survivors of domestic abuse. I worked firsthand with women from all backgrounds, helping them to apply for protective orders and providing moral support in court hearings. I was passionate about the work I did with House of Ruth, and, as a result, when I returned to campus, a lot of my academic work in the poverty program focused on the unique issues facing women attempting to escape abuse. I also joined the Bonner Program and completed many of my 900 volunteer hours as an advocate at Project Horizon, the local women’s shelter. Just like I had experienced in Poverty 102, I felt passionate about connecting my studies with real life issues that mattered. My junior year, I discovered the Women’s and Gender Studies minor and took a course at Washington and Lee’s law school on legal theory related to women’s issues, including domestic abuse. As a student, it was eye-opening for me to realize that real world problems like what I had observed at House of Ruth and Project Horizon could be analyzed from an academic and legal perspective. It wasn’t until I discovered my two minors in Poverty and Human Capability Studies and Women’s and Gender Studies that I began to feel that my college studies were driven by a sense of purpose. I started to realize that, although the world was filled with injustices, it was possible to work towards a better world. After graduation, my work with Teach for America as a bilingual teacher on the border of Texas and Mexico exposed me to another dimension of public interest work. Although working in education is, on the surface, very different than advocating for abuse survivors, for me the motivation comes from the same place. My work to advocate for those who are underrepresented was and continues to be incredibly personal. My academic studies, particularly within the poverty program, internships, volunteer experience, and now work experience have all showed me the different sides of what it looks like to work towards increasing access to justice. Now, I am taking a different step forward and will begin studying at the University of Texas School of Law this fall. Law school will further enable me to expand my passion for the public interest with the goal of making a meaningful impact on our society. In both my undergraduate work and my work as a bilingual teacher, I have seen the impact our country’s legal systems can have for better or worse on underrepresented populations. I know my journey in law school will enable me to discover the unique role that I will have in increasing access to justice for those who most need it, and I am forever grateful to the Shepherd Poverty Program at Washington and Lee for sparking my journey down this life-changing path. Karcher graduated from Washington and Lee University in 2011 with a bachelor of arts in politics and minors in poverty and human capability studies and women’s and gender studies. Upon graduating, Kara worked with Teach for America in the Rio Grande Valley region of Texas as a bilingual elementary teacher. 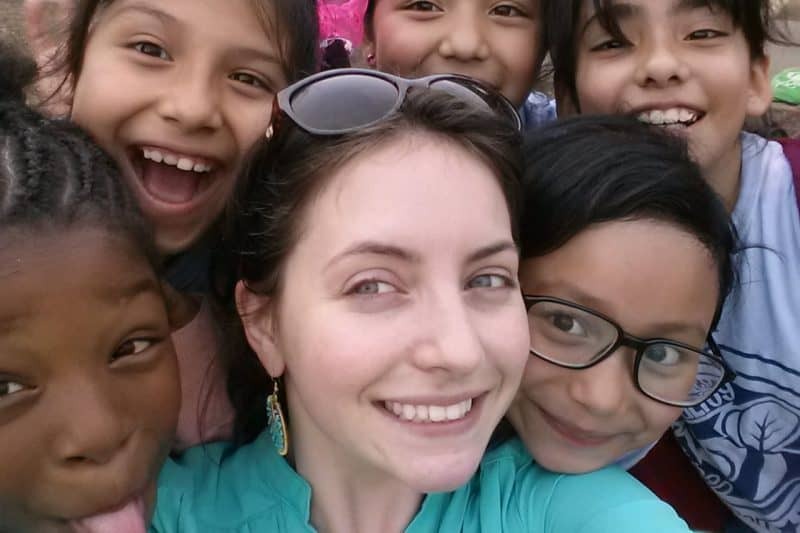 Upon completing the two-year program, Kara continued to teach in the bilingual classroom for several years and completed her master’s in bilingual education at the University of Texas at Brownsville. Beginning this fall, she will begin her studies at the University of Texas School of Law, where she hopes to specialize in public interest law and continue her work with women and children.